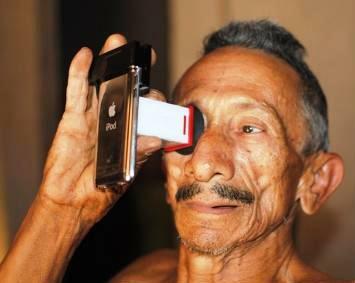 Here’s another way the iPhone is revolutionizing medicine — it’s now a cheap, portable tool for detecting cataracts, the leading cause of blindness worldwide. Researchers at the Massachusetts Institute of Technology have developed Catra, a cheap plastic lens that clips onto the iPhone’s screen. Using a simple vision test, the Catra software creates a map of cloudy areas that may indicate the onset of cataracts. The Catra software can provide a diagnosis within minutes and requires no training. It also works on the iPod touch and other smartphones. It’ll be a boon for use in developing nations, the researchers say. Below is a video explaining how it works. Catra will be shown off at Siggraph in Vancouver next month.